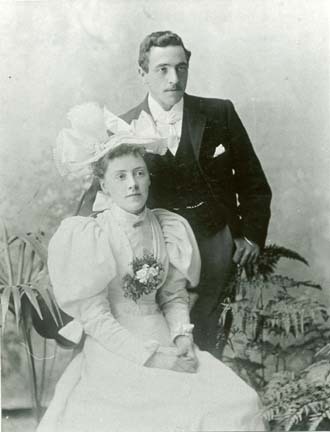 Married 1896 to Rosa (shown). My mother has a copy of this photograph in a family photograph album of the large, leather-bound impressive kind. Rosa was sister to my great-grandfather, Samuel Dennitts Spare. The Spare family came from Uttoxeter, Staffordshire, and had links with Wirksworth. Rosa and Sam's mother was Thirza Dennitts, sister to Anne Dennitts who married Samuel Killer and lived in Wirksworth. Another sister, Louisa Lydia, married Samuel Arthur Thompson of Sheffield; both of Arthur's parents were from Wirksworth, namely William Thompson and Ann Houghton. We believe Rosa and Abel later moved to Forest Town, Macclesfield.